Pentax today announced the Pentax Q10, a minor update of the mirrorless camera with the smallest sensor, the Pentax Q. By small, I mean really small, as in 1/2.3". To put that in context, that's 4.62 x 6.16mm in size, or a crop from 35mm frame size of 5.6x (even a Nikon is only 2.7x, while m4/3 is 2x, and NEX and NX are 1.5x). When the original Q came out (at a bigger than expected for its small size US$900 with lens), Pentax didn't help themselves by introducing three "Toy" lenses with it. That's not me being coy; Pentax actually prints the name "TOY LENS" on these options, as in "04 TOY LENS WIDE" and "05 TOY LENS TELEPHOTO." The high price coupled with the bad marketing message from the word "toy" made the Q a no-go on the market. Even with the current street price of the 47mm equivalent "real lens" kit at US$400, the camera isn't selling well. Which is a bit of a shame, as several people I know using it say it's quite a nice compact camera with traditional controls, except with a bit more lens flexibility. Today, Pentax tries to relaunch the Q, with the updated model now called the Q10. It looks nearly identical to the Q and has basically the same features as the Q, so let's talk about what seems to be new: you get can it in Silver and Red, the image sensor and autofocus system have been improved in mostly unspecified ways, and the base ISO is now 100 instead of 125. Oh yes, and the price is now US$600 with the kit lens (which is US$150 less than the Pentax online store is selling the current Q for today). The new camera will be available in October. 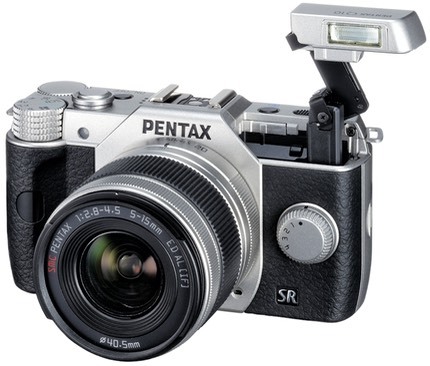 Along with the Q10, Pentax launches a new lens and adapter. But before I get to that, I suppose that since I haven't covered the Q previously, I should mention what we had the first go around: 8.5mm f/1.9 (47mm equivalent) and 5-15mm f/2.8-4.5 (28-85mm equivalent). Plus the three toys: 3.2mm f/5.6 (fixed) fisheye (180° diagonal), 6.3mm f/7.1 (fixed) (35mm equivalent), and 18mm f/8 (fixed) (100mm equivalent). The new lens is the US$300 15-45mm f/2.8 ED (85-250mm equivalent), and as 80-200mm type lenses go, pretty darned small (40.5mm filter size; try comparing that to your Nikkor 80-200mm). 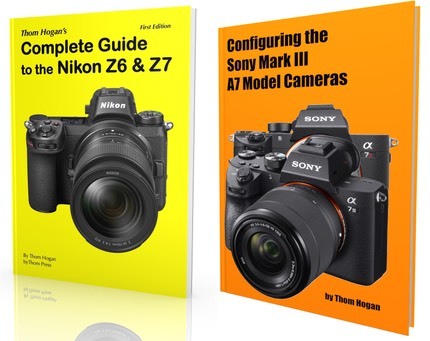 That certainly rounds out the basic kit lens lineup in a nice fashion. The US$250 adapter is for K-mount lenses (remember, you have a 5.6x crop factor, so pretty much anything you'd "adapt" is going to end up being a telephoto). Lens adapters for the Q for most other lens mounts are available from third parties, should you be interested. I don't think I'm overstating anything by saying that Pentax so far has shown the most "different" approach to mirrorless of the major camera companies so far. Add up their options: the "miniature" Q (and now Q10), the "designer" K-01, and the Ricoh-branded "modular" GXR. None of these cameras are mainstream, and all have their unique attributes. But the Q still seems to be the most curious mishmash, as if Pentax themselves don't quite know what to do with it. US$250 for a lens adapter that has no lenses in it and isn't electronically coupled? But US$300 for an 80-200mm f/2.8 lens equivalent? And where does the "10" come from? I can't even find 10 things different on the new version of the camera, so this is marketing at its worst: the big leap in name implies far more than is delivered. The marketing message ought to be simple: a truly pocketable interchangeable lens camera with top compact camera level performance, all with traditional DSLR-type controls. Heck, if Fujifilm were marketing this, it would be called an X-Consumer1 and everyone would rush to buy it. Update: one reader suggested that 10 was really meant to be read as binary (thus this is the Q2). But that doesn't really change the fact that someone at Pentax doesn't know how to name things. Remember *ist?